Spence Diamonds challenges many of the paradigms of traditional jewelry shopping. 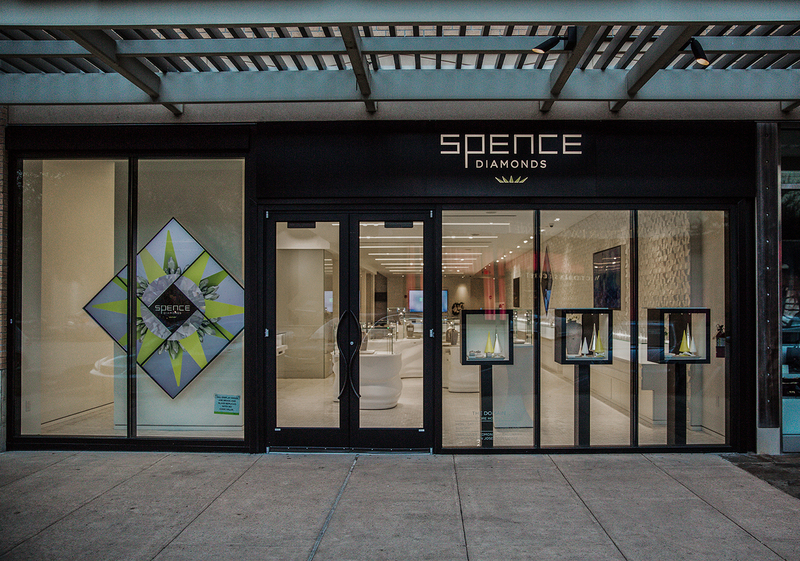 The new innovative store concept pairs a fun, transparent and educational experience with a breakthrough product offer – Spence Artisan Created Diamonds™. Spence is a “disruptive” player in an industry that is burdened with traditions related to the sales process, product, and even customer perception. They take a fresh approach in all these areas, through a unique and proprietary approach to finding the “perfect” diamond with perfection defined around price, product, and person, and in a way that provides the customer with an opportunity to create a one-of-a-kind, personalized products. Their pricing is explained and displayed transparently, so consumers know upfront what is perfect for their budget and taste. The store encourages a relaxed feel, promoting an experience that is fun and contemporary. Spence Artisan Diamonds are ‘grown’ in a laboratory using an incredibly advanced scientific process that replicates how diamonds naturally develop when they form beneath the Earth’s crust. In this highly controlled environment, plasma energy converts carbon to diamond molecules, one by one, creating a new diamond over the course of weeks.